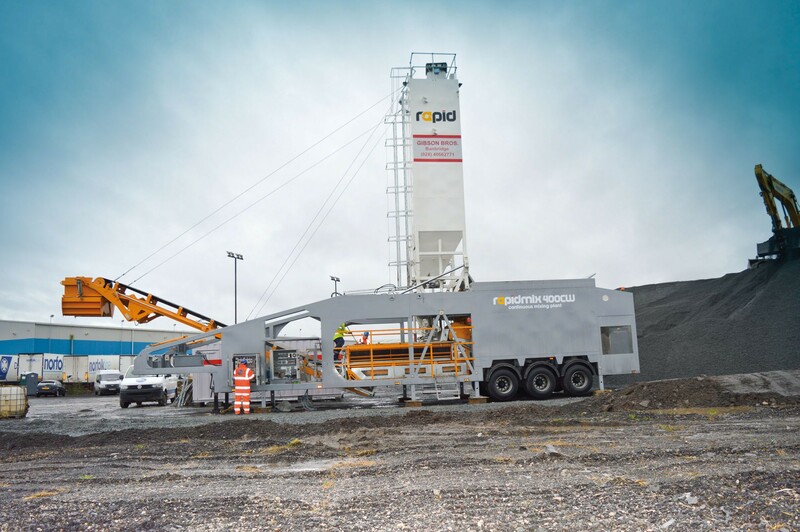 County Armagh, Northern Irel and, 6 January 2015 – Rapid International Ltd (County Armagh) has recently supplied local road contractor and quarry group Gibson Bros (County Down) with a new Rapidmix 400CW mobile continuous mixing plant. The Group will commence using the plant on the new Belfast Harbour Development Scheme. The new Rapidmix will provide the Gibson Bros Group with advantages to meet the demands and requirements of its future contracts. Gibson Bros will also add the Rapidmix to its existing fleet of rental plant available for short and long-term hire. The new Rapidmix plant is currently on-site at Belfast Harbour, where Gibson Bros is undertaking development of the Victoria Terminal 3 Hinterland site for Belfast Harbour Commissioners. This 20,000m2 pavement project will form an integral part of the harbour re-development when completed in February. A key part of the pavement construction will be the installation of a Hydraulically Bound Mixture (HBM). Semi dry mixes, such as HBM, are typically less economical to produce in a conventional static batch plant. The Rapidmix mobile continuous mixing plant solves this problem as it is specifically designed for semi dry mixes such as HBM’s, ensuring a high output of high quality homogenous material at all times. The on board high speed Rapid Twin Shaft mixer contains chill cast steel mixing paddles which are intermeshed in a specially phased relationship to optimise mixing action, whilst maximising throughput. 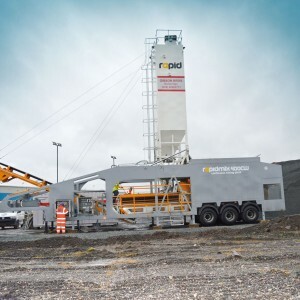 Established in 1969, Tandragee based Rapid International delivers high quality, reliable equipment to the concrete, construction and environmental industries. Today, with a presence in more than twenty countries worldwide via an ever expanding international dealer network, Rapid is a trusted partner to a wide variety of customers ranging from multinational construction groups to small concrete producers.